Mercy Flight of WNY| Case Studies | Flynn and Friends, Inc.
"Golden hour" is the term for the critical minutes during which emergency medical treatment must start for the victim of a serious injury. The need for this rapid response is the reason-for-being for Mercy Flight, the not-for-profit emergency air ambulance service for Buffalo and the eight surrounding counties of Western New York. On the eve of its 20th anniversary, Mercy Flight asked Flynn & Friends to develop a campaign to raise awareness, friends and funds to support its life-saving mission. 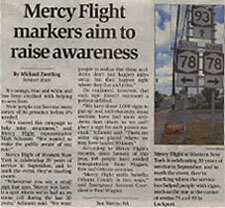 A fact, a perception, and a word association combined to create the concept for Mercy Flight's 20th anniversary. The fact was that Mercy Flight had flown more than 3,000 critically ill or injured patients from outlying areas of Western New York to emergency medical centers in Buffalo since its founding. The perception was that "sacred places" are often born from tragic or dramatic events. Think of roadside shrines that mark the scene of fatal accidents or battlefield memorials. The word association happened late into a two-hour brainstorming session. Someone said something like, "Hey, remember that old saying 'Murphy was here? 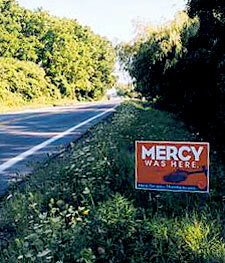 "; "Murphy" morphed into "Mercy"; and suddenly, the planets aligned: place roadside signs with the headline "Mercy Was Here." at each of those scores of places where it had saved lives. Add a subhead that read "Here for you. Thanks to you." to underscore the public support needed to keep Mercy Flight fiscally healthy. Finish it off by acknowledging Mercy Flight's emergency services partners with a sticker listing each by name. This solution was simple, dramatic, and measurably effective. No one driving the roads of Western New York during the summer the campaign appeared could fail to see at least one of our signs or billboards. And when they saw another, and another, and another, and another, our goal of communicating the importance of Mercy Flight's life-saving mission was unforgettably driven home. We developed a strategy to supplement the 3,000 "Mercy Was Here." 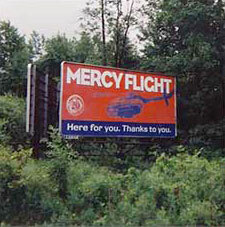 roadside signs with 60 billboards chosen for their proximity to places where Mercy Flight had landed since its founding. One measure of this higher awareness was a 30% increase in calls for Mercy Flight service during the campaign. A second was a response by the New York State DOT to safety problems along a stretch of road whose dangers were highlighted by a half dozen "Mercy Was Here." signs. A third was that dozens of letters spontaneously poured into Mercy Flight from survivors and their families, reminded of their experience by encountering the signs. Some, like that of David Weber, Jr., included pictures taken at the scene of their rescue. The campaign, in combination with Mercy Flight's own community relations efforts, garnered considerable press attention: 20 television and 7 radio stories or mentions and 13 articles in various newspapers throughout the area. "Mercy Was Here." raised awareness and friends for Mercy Flight. 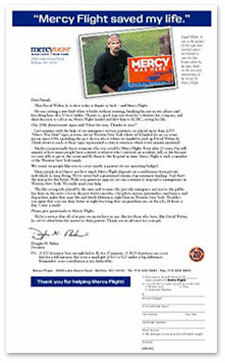 The next step was to raise funds, and to that end Flynn & Friends created and managed a direct mail solicitation in the fall following the sign campaign. Our strategy was to target households qualified by income in area zip codes where Mercy Flight is most active. We designed, wrote and mailed a simple one-page letter with a "Mercy Was Here." sign at the top which emphasized the fact that individual contributions account for nearly 20% of Mercy Flight's operating budget. The campaign brought in 723 new donors, with an average gift of nearly $40. Subsequent direct mail campaigns in the spring and fall of 2002 added another 2,000 names and donations on an equivalent level. If you've read this far, we must be doing something right. Which brings us to our point: we can do right by you, too. Mercy Flight saw its 20th anniversary as an ideal opportunity to increase awareness of the critical service they provide to Western New York. They called Flynn & Friends for help, and we delivered a campaign beyond their expectations. We can do the same thing for you. We believe that marketing with clear goals and confidence in the creative process can produce measurable results. Whether your goal is raising awareness, creating an identity, designing an effective website, attracting media attention, or just making your name top of mind, Flynn & Friends can help. We invite you to look at some of Our Work. Or email us or call us at the number below. We are looking for quality businesses and organizations who, like Mercy Flight, will benefit from our strategic, creative, and communication skills. We are also interested in your feedback. More than 3,000 signs like this were posted at every place Mercy Flight had landed in Western New York. It was impossible to go anywhere in the area without seeing them, and being struck by their meaning and significance. Billboards further reinforced the roadside sign campaign. The media, like the marketplace, was influenced by the campaign. No fewer than 40 stories ran in print, television, and radio over the course of the campaign. The finale came in the form of a direct mail campaign that not only paid for the cost of the campaign, but built an ongoing donor database for this life-saving service.